Mount Kailash (Kang Rinpoche / Kang Tise) on a contoured and GPS compatible map at 1:50,000 from Swiss publishers Gecko Maps, with a plan of Darchen and an overview map of Tibet, plus on the reverse a panorama map of the area. 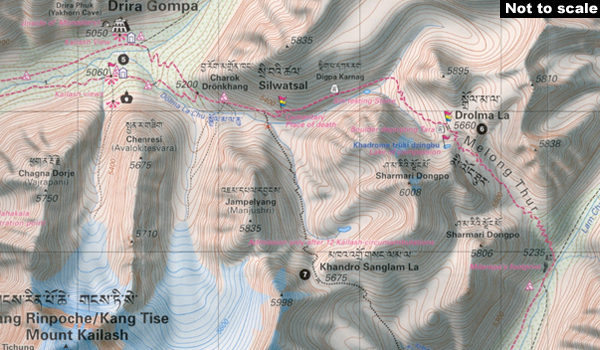 The map is centred on the peak of Kailash and extends northwards from the approach road from Lhasa to Darchen, beyond Drira Gompa, to the peak of Trolung La. Topography is vividly presented by contours at 20-metre intervals, enhanced by relief shading and colouring/graphics for glaciers, swamps, forest, etc, plus plenty of peak names and spot heights. An overprint shows the trekking circuit around the mountain, highlighting various landmarks as monasteries, chortens, prayer flagpoles and ritual sites, also viewpoints, ruins, lodges, shelters and campsites. Other local trails are also marked. Latitude and longitude are shown by 1' margin ticks. All place names are in both in Latin and Tibetan alphabet. Map legend includes English. Also included is a plan of Darchen at 1:4,000 showing tourist accommodation, plus a small overview map of Tibet and the Himalayas to indicate the location of the mountain and main tourist centres. On the reverse is a hand-drawn panorama map of the region showing the mountains on both sides of the valley of the Dzong Chu River and Darchen; to the north the Kailas massif and Drida Gompa - in the south the lakes of Rakas Tal (Langa Tso) and Manasarovar (Mapam Yumtso / Tso Mapam) and the peak of Gurla Mandhata (Memo Nani).